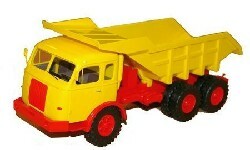 Golden Oldies line 25, stands for the scale 1:25 in which the trucks / construction machines - oldtimer models are built. Thus, these models also fit into the collections of LKG, PIKO, REVELL and many more. In addition, the tipper models are a nice addition for the construction machine as well as for the track II railroad. The models are made in a two-component injection-molded plastic (RESIN) in order to display fine details. Some parts are manufactured in etching technology, the tippers can be raised and the wheels made of rubber are mobile.